There is a saying among mechanics that it is not a good thing to have parts left over when you are finished with a repair job. The idea, obviously, is that if there are parts left after you have disassembled and reassembled a complicated mechanism, you must have forgotten to put something back in. Most machines won’t work in this condition, and if they do, there is a good chance that they won’t work correctly. I have never been so terrified as when I had to stand by and watch one of my mechanics at the steel mill take apart a hydraulic control valve and reassemble it. 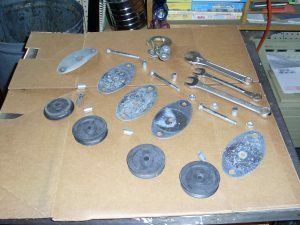 When the machine still didn’t work right (the valve wasn’t the problem, the operator had sabotaged the machine so he wouldn’t have to do any work) he proceeded to take the valve back apart and then try putting it back together leaving out various parts. Needless to say, I had to wait until he clocked out and then fix the machine myself (I used all the parts). Today though, I took a page from my old mechanics book, and repaired something by leaving parts out on purpose. 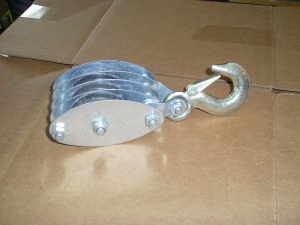 When I went to the second hand store this week, I spotted a 4-sheave pulley on the shelf for sale very cheap. As I picked it up, though, I realized why it was marked so low. 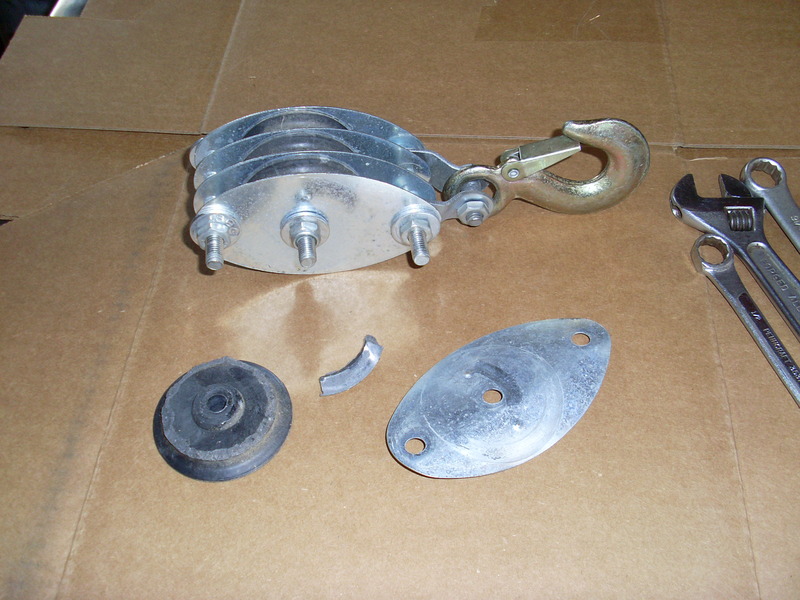 It was nice light duty pulley, but someone had grossly overloaded it (by like trying to pull a stuck bulldozer out of the mud with it) and bent one of the side plates and broken one of the sheaves. I noticed that it was of bolt together construction, though, so I bought it anyway, figuring that I could fix it by just eliminating one of the sheaves. 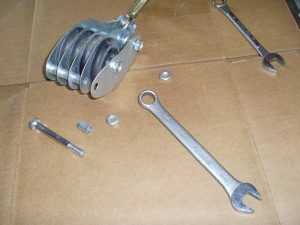 I took it apart today at the store, and it was just a matter of loosening the nuts and then pulling the through-bolts out. The plates were just held apart with loose collar spacers, and I only dropped them all on the floor once. I then put it all back together minus one roller and side plate. 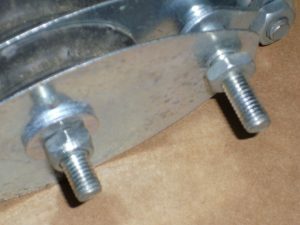 It almost worked, but the bolts were then a little too long and would not tighten down enough to be snug. 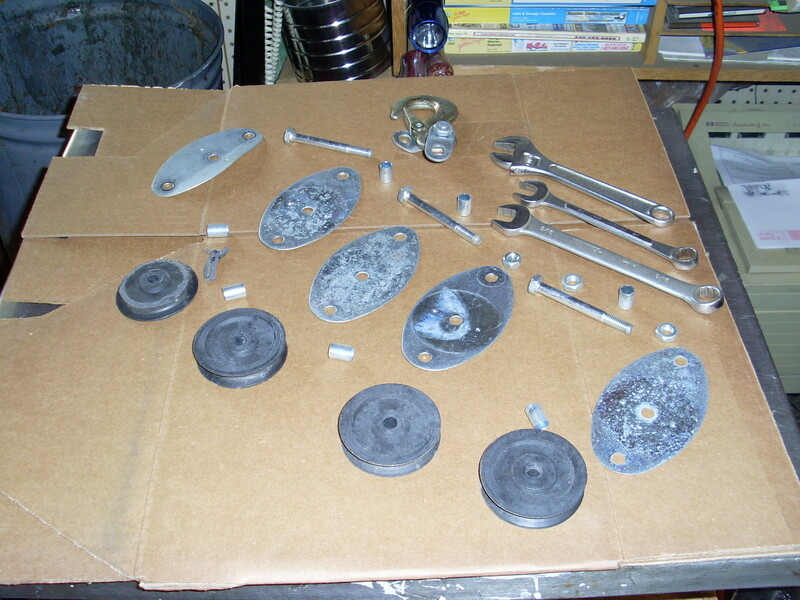 I took it all apart a second time (didn’t drop anything this time) and added two thick washers to each through-bolt. 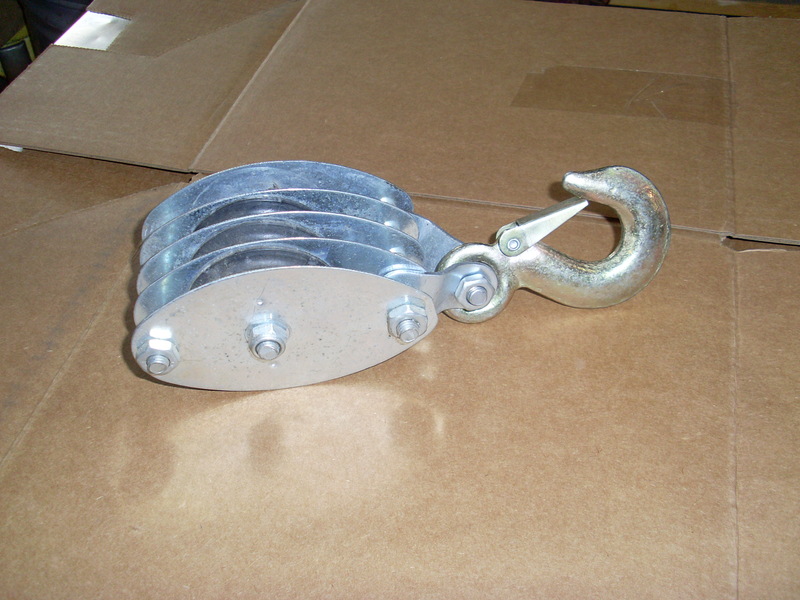 That added just sufficient length so that the nuts would tighten down correctly.